I work with different technics and materials depending on the context where a piece is shown. What interests me is how the context alters the interpretation. Materials that are left over and are presented in unexpected forms, changes the perception and turn over given notions. It makes the world a less static place and more open for different approaches, which is the aim of my art projects. In one of my latest pieces To be continued I embroidered graphically produced curves on bandages from Red Cross surplus storage. The curves are mainly from daily newspapers and illustrate the current course of events, for instance the exchange rates of US dollars and euros, the price of energy, the water quality. To be continued became a diary over events in the World both nearby and far away. It also connects to the story of Ariadne’s thread, which saved Theseus from the mace of Knossos and our need to create ongoing stories of random events. In another piece Brecht´s library I recollected the books Brecht wanted to bring to Helsinki, when he fled from Stockholm during the Second World War. The list of books is described in Peter Weiss’ book Die Ästhetik des Widerstands . Peter Weiss book is a novel so if the list is real or fiction I don´t know. The list correspond with some sort of canon for classical literature of mainly male and western European writers. Many of the writers are seldom read today. 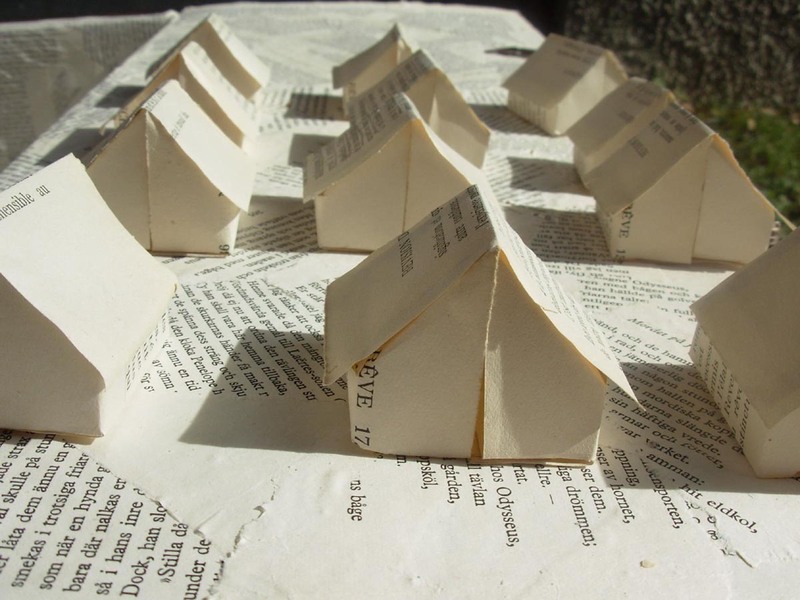 Of the pages in the books I built small models of tent camps and other shelter for people on the run. The models were applied onto cardboard boxes, and the boxes were mounted on walls and floors depending on where the project is showed. I also invited people to build the models and to find new ways of constructing shelter from the pages. 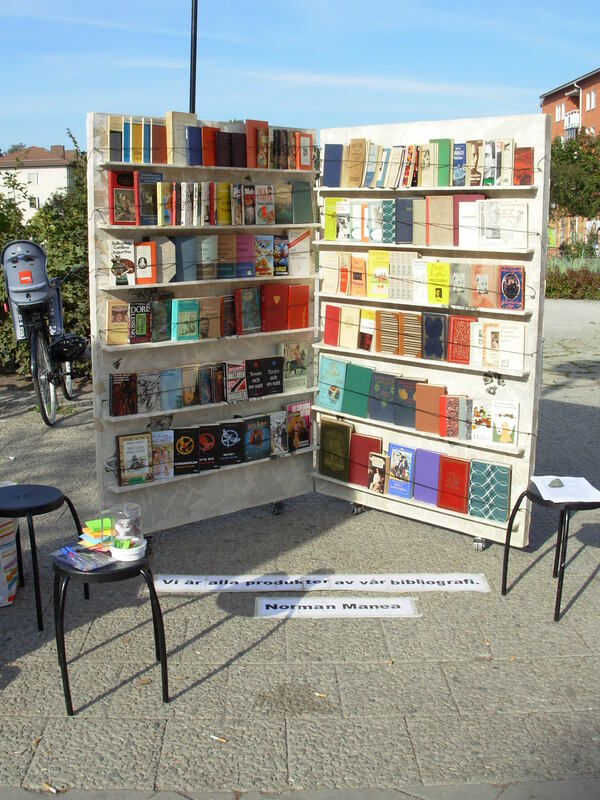 People were also invited to bring samples or suggestions of books they would take with them if they would have to flee, in order to update the list of books. 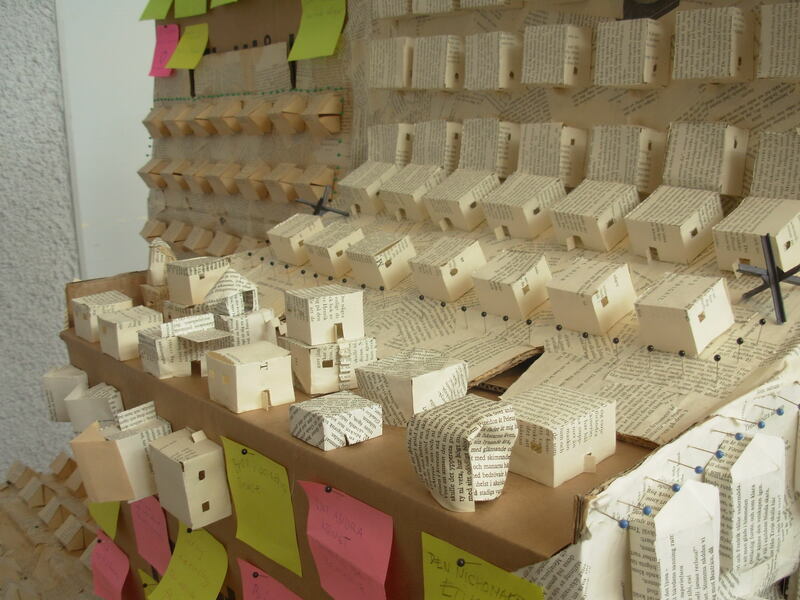 The aim of the project, when books literally speaking were transformed into shelter for people in need, was to discuss the need of urgent texts and their meaning for people on the run. My work is based on the myth of Actaeon, the young hunter who wandered into a forbidden part of the forest where he saw Artemis, the goddess of hunting, and her nymphs bathing naked in a pool. As a punishment, he was transformed into a deer and was chased and torn apart by his own dogs. What does this old myth have to do with our modern society and its flow of images and information? What I have found relevant is precisely the possibility to study a course of events from a distance, without taking part, and then suddenly finding yourself unveiled and chased by your own most loyal adherents. The safety behind the screen is a chimera, for by taking part of the flow of images you also become a collaborator. Today’s flow of images has both created a distance between us and placed us in direct communication in real time with most of the world. My work also refers to the gaze that characterized a large part of the 20th century: the urge to classify and divide the world into different systems of hierarchy based on gender and race, a way of thinking that unfortunately has found new disciples through all the channels that our new systems of communications offer.